Royal Thames Ocean Match, Nore to Dover, for the Queen’s Cup, June 24, 1874.
oldest organized society associated with yachting in England, for it traces its descent from the Cumberland Fleet—a club which was formed in the year 1775. There is record of a yacht race from Greenwich to the Nore and back in 1749 for a prize pre­sented by Prince George, afterwards King George III. ; but we have to wait until 1775 to find any mention of an organization in connection with yachting. The origin of the club was the immediate outcome of a race, for sailing boats of 2 tons to 5 tons burthen, for a silver cup pre­sented by the Duke of Cumberland, brother of King George. The course on that occasion was from Westminster Bridge to Putney Bridge and back, and the winner was a boat named Aurora, belonging to a Mr. Parks. It is interesting to note that the pioneers of the sport in an organized form were small-boat sailers, and to-day it is still recognised that the best interests of yachting are served by encouraging the smaller classes. The newly-formed club flourished, and its races between Putney and Blackfriars were events of note in the London entertainments of that period. The Duke of Cumberland, himself a sailor, took a great interest in the welfare of the society which bore his name. He gave cups for competition, and the presentation of one of these trophies to a winner was always made the occasion of much ceremony. The last cup presented by the Duke was competed for in 1786, but the club had a continuous existence until 1823. In that year a regatta was held in celebration of the coronation of King George IV. This was the last held by the club under its original title, for, in commemoration of the occasion, the name was altered to that of the Coronation Society. At the first regatta held under its newly-adopted title, a dispute arose in regard to a protest lodged by a competitor in one of the races. This resulted in a serious split amongst the members, and one faction, composed chiefly of competitors in the race over which the dispute had arisen, seceded from the Society. These yachtsmen formed a new club, which they named the Thames Yacht Club. The precise date of its foundation was August 23, 1823. The Coronation Society continued, but, with many of its most active supporters gone, its existence was struggling, and in 1831 it was dissolved, and the majority of its members joined the Thames Yacht Club, which was already a flourishing organization. From the date of the formation of the Cumberland Fleet down to the year 1842 the club flew the white ensign, but in the latter year the privilege was withdrawn by the Admiralty, on the adoption of the white, as the distinguishing ensign of the Royal Navy. Some of the original flags of the Cumberland Fleet are now carefully preserved in glass cases in the inner hall of the club’s premises in No. 7, Albemarle Street. 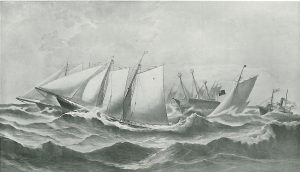 This club has the distinction of having introduced the first reasonable system of measurement, which regulated yacht-racing for very many years, and which will probably remain, under the mystic symbols ‘T.M.,’ a memento of its early virility so long as yachting continues to flourish in this country. The “tween bridges’ courses for races were discarded in 1840, owing to the increasing sizes of yachts, and for many years the matches have been sailed from the Lower Hope, round the Mouse, and back to Gravesend, with the exception of a few seasons, when a triangular course off Southend was tried. The Lower Hope and Gravesend course has been reverted to this year. 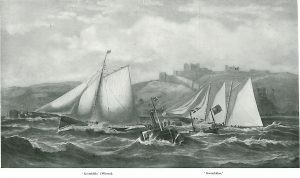 Finish of Royal Thames Ocean Match, Nore to Dover for the Queen’s Cup, June 24, 1874. The Royal Thames Yacht Club has always maintained the position which it should rightly occupy as the senior yacht club in the country. With the development of the sport, it has always kept abreast of the times, and is to-day one of the most active clubs associated with yachting. King Edward, when Prince of Wales, was at one time a member of the club, and its membership, now amounting to over 800, includes the majority of the prominent yachtsmen of the day.